Details: The Monkey Bar Adventure Swing set is constructed of heavy-duty, powder-coated steel and UV-protected polyethylene plastic, so it's weather protected against rusting, discoloration, and heat retention. Won't split, splinter, or warp like a wooden playset. Designed for safety with rubber grips on swing chains to keep little fingers from getting pinched, as well as capped or rounded edges with no rough edges exposed. The monkey bar swing set is designed with lots of activities to keep kids happily in motion for hours. 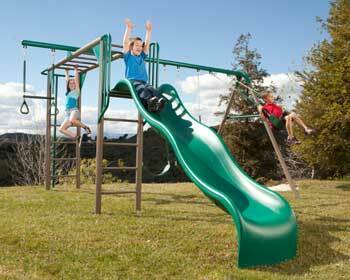 Includes monkey bars, belt swings, wavy slide, trapeze bar, and a fire pole. Freestanding, with no cement required.The Monkey Bar Adventure Swing Set is constructed of heavy-duty powder-coated steel and UV-protected polyethylene plastic so it's weather protected against rusting, discoloration, and heat retention. Won't split, splinter, or warp like a wooden playset. Designed for safety with rubber grips on swing chains to keep little fingers from getting pinched, the Monkey Bar Adventure has capped or rounded edges with no rough edges exposed. This swing set is designed with lots of activities to keep kids happily in motion for hours, including monkey bars, belt swings, a 9-foot wavy slide, trapeze bar, and a fire pole. Slide can be set up to be on left or right side of the system. This unit is freestanding, with no cement required. The Monkey Bar swing set features a 9-foot wavy slide, monkey bars, 3 swings, a trapeze bar, and a fire pole.